LAKE SUCCESS, N.Y., November 11, 2009 – The new season of NBC’s Saturday Night Live debuted not only with an a new cast, but with a new look for the opening title sequence as the entire opening montage was shot using the Canon EOS 5D Mark II and the new Canon EOS 7D digital SLR cameras. The concept behind the opening sequence was portraiture as the director and crew looked to capture “living” portraits of the city, the cast and the unique characters that make up the New York City nightlife. The crew wanted to capture the city nightlife in as natural a look and setting as possible. This meant minimal additional lighting, and making those on-camera feel comfortable to act naturally. Their solution was the Canon EOS 5D Mark II and Canon EOS 7D Digital SLR cameras, with their amazing low-light performance, small form factor, and amazing depth-of-field, which enabled the crew to shoot in predominantly ambient light without big lighting gear. The crew also found it easy to covertly shoot around the city without drawing a crowd. The entire sequence was shot using a combination of Canon’s full-frame EOS 5D Mark II and the selectable frame rates of the EOS 7D Digital SLR cameras. 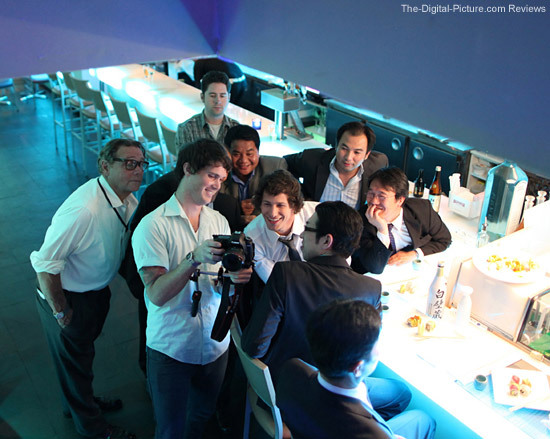 Filming at night, the new stars of the hit TV show were shot in various New York City hotspots by a small crew discretely capturing the cast as they participated in select New York happenings. The entire segment was captured and edited in a week’s time, incorporating 30p footage from Canon’s 5D Mark II as well as 60p footage used for slow-motion segments shot with Canon’s EOS 7D Digital SLR camera. 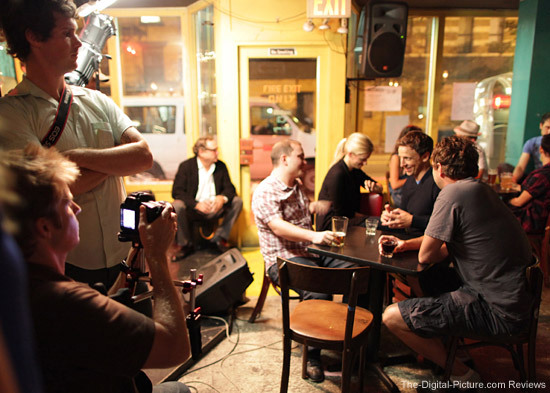 The end result was that the cast and crew were able to shoot in any location – from the Brooklyn Bridge, which has limited ambient light, to a dimly lit street corner, to a more controlled bar interior – using only an on-camera Litepanels MiniPlus for most of the exterior shots and two Kino Flo lights for an interior shot that required some illumination enhancement. The lack of heavy equipment allowed the crew to move around the city quickly and shoot in some tight spaces. “We have seen a shift in HD video capture toward a simpler and easier HDSLR workflow, and now with the EOS 7D shooting in standard NTSC and PAL frame rates, customers are realizing an even easier HD video workflow, using some of the largest HD video image sensors on the market at a fraction of the cost of competitive equipment,” stated Yuichi Ishizuka, senior vice president and general manager, Consumer Imaging Group, Canon U.S.A. The Canon EOS 7D and EOS 5D Mark II empower cinematographers with a high-quality HD video solution featuring full manual exposure control and more than 50 Canon EF lenses to chose from, shooting on two of the industry’s largest HD video sensors. The EOS 7D also features selectable cinematic frame rates. The EOS 7D features Dual DIGIC 4 Imaging Processors and a large APS-C–sized CMOS sensor, while the EOS 5D Mark II features a single DIGIC 4 Imaging Processor and larger Full-Frame CMOS sensor, helping to render stunning color reproduction, amazing depth of field and fine high-definition detail. The Canon EOS 7D records video in one of three modes – Full HD and HD in a 16:9 aspect ratio and Standard Definition (SD) in a 4:3 aspect ratio, all at selectable frame rates: Full HD at 1920 x 1080 pixels in selectable frame rates of 24p (23.976), 25p, or 30p (29.97); 720p HD recording at 50p or 60p (59.94) and SD video at frame rates of 50p or 60p (59.94). The EOS 5D Mark II features 16:9 Full HD video capture at 1920 x 1080 pixels and 30 fps as well as 4:3 standard TV quality (SD) video capture at 640 x 480 pixels and 30 fps. The EOS 5D Mark II features 16:9 Full HD video capture at 1920 x 1080 pixels and 30 fps as well as 4:3 standard TV quality (SD) video capture at 640 x 480 pixels and 30 fps. Both cameras record video up to 4GB clip length, depending on the level of detail in the scene, a 4GB clip can record approximately 12 minutes of video at full HD resolution or approximately 24 minutes in standard definition. For both the Canon EOS 7D and EOS 5D Mark II, sound is recorded either through an external stereo microphone or a built-in monaural microphone. Canon U.S.A., Inc., is a leading provider of consumer, business-to-business, and industrial digital imaging solutions. Its parent company, Canon Inc. (NYSE:CAJ), a top patent holder of technology, ranked third overall in the U.S. in 2008†, with global revenues of US $45 billion, is listed as number four in the computer industry on Fortune Magazine's World’s Most Admired Companies 2009 list, and is on the 2009 BusinessWeek list of "100 Best Global Brands." Canon U.S.A. is committed to the highest levels of customer satisfaction and loyalty, providing 100 percent U.S.-based consumer service and support for all of the products it distributes. At Canon, we care because caring is essential to living together in harmony. Founded upon a corporate philosophy of Kyosei – "all people, regardless of race, religion or culture, harmoniously living and working together into the future" – Canon U.S.A. supports a number of social, youth, educational and other programs, including environmental and recycling initiatives. Additional information about these programs can be found at www.usa.canon.com/kyosei. Here is the Saturday Night Live Opening Title video. Drag the slider to about 4:48 into the show.